You will recall that we are attempting to impartially examine the resurrection of Jesus Christ. We have observed that the resurrection violates the Regularity of History, and we have eliminated the empirical and the scientific possibilities. All that remains is the miraculous. Our question now is whether or not there is suitable evidence to warrant belief in this alleged miracle. The question we need to ask for the moment is this: when did the resurrection allegedly take place? Historians from both the believing and the disbelieving camps tell us that the Jesus described in the Bible was likely crucified (either in fact or in fiction) sometime between 27 CE and 33 CE. Since this is a timeframe of six years, let us, for this discussion, assume the average and conclude that the resurrection allegedly occurred in 30 CE. If we allow that it occurred in 30 CE, our next question must be this: is there any documentation from that time that corroborates the resurrection story? In other words, was there anyone who was actually there at the time and who chronicled the events at the moment they were happening? This is important because if we were trying to assess what happened at, say, the battle of Gettysburg, we would hope to find accounts from those who 1) were there and, 2) were documenting the events as they were happening or very soon after. If our first written accounts of the battle of Gettysburg came from a sketchy source who was writing two or three decades after the fact, it would be extremely difficult to be confident about piecing together the details of the battle. At this point, we must observe that the farther we go back in history, the harder it is to know for sure what took place when. For instance, we have much more solid documentation regarding what happened at D-Day than we do for what happened at the assassination of Julius Caesar. The nature of history is such that the farther back we go the less certain we can be. Therefore, regarding an event that allegedly took place nearly 2,000 years ago, we would hope to have something that is highly corroborative; in other words, something that was documented during or soon after the event in question. Do we have something of this nature? As of yet, according to the historical record, we do not. The earliest written account of Jesus’s resurrection shows up in 1 Corinthians, a letter composed by Paul of Tarsus, which wasn’t written until circa 55 CE, over two decades later. The gospels, which are more definitive as narratives than the aforementioned letter of Paul, were composed several decades after that (Matthew, the earliest gospel to contain a resurrection story, was likely written circa 80 CE; John, the latest, was likely written circa 90 CE). Thus, in our unbiased investigation we must observe that at least 25 years separate the alleged resurrection from the first written documentation of it (1 Corinthians), and that 50 or more years separate the alleged resurrection from the first narrative to speak of it: the gospel of Matthew (the gospel of Mark, written circa 70 CE, did not originally contain a resurrection story; it was inserted later, a point with which even Christian scholars concur). Nevertheless, we still must be fair and responsible to review the evidence. 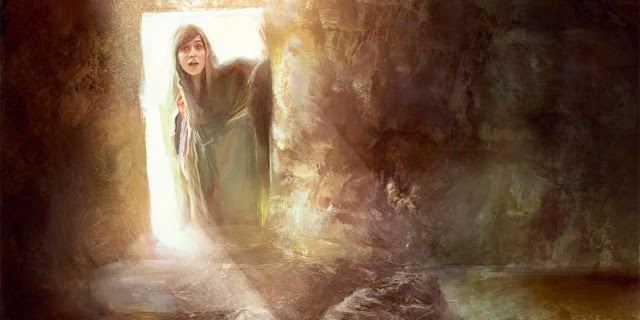 On that note, we should remember that we do not have any physical evidence to corroborate the resurrection (i.e., there are no tangible artifacts that could shed any light on the subject—and no, the “empty tomb” does not count because we cannot verify the tomb in which Jesus’s body was interred, nor can we verify what, if anything, was done to the body after that point). Thus, all we have to go on arewritten accounts. As such, it should be painfully obvious to anyone reading this that the chief source of “written evidence” comes from the New Testament. No surprises there. However, for the time being, let us shelve the New Testament and come back to it later. In the meantime, let us ask this: what else is out there? The believers point to several supplementary sources—sources which the atheists reject completely. We, here and now, are going to review them in chronological order. This is an interesting citing to be sure, but one thing it is not is corroborative evidence for the resurrection. In fact, if we are going to be impartial, we must observe that this isn’t even corroborative evidence for anything regarding the life of Jesus. He is not mentioned by name, nor is there anything mentioned that even loosely alludes to his story—save for two things: an earthquake, and a “darkness.” A darkness was reported at the crucifixion; it is mentioned in three of the four gospels. Similarly, an earthquake was reported at the crucifixion; it is mentioned in the gospel of Matthew. But we must ask a few questions. First, is there a date given in the Thallus citing? No, there is not. Hence, can we conclusively know to which earthquake Thallus refers? No, it is impossible. Earthquakes aren’t exactly infrequent, after all. Further, the only scientific explanation for a “darkness” would be an eclipse of some kind. Again, no date is given; we therefore cannot know if this darkness is indeed a reference to an eclipse or when this eclipse occurred. Like earthquakes, eclipses occur with some regularity. Is this evidence interesting in that it does line up with certain aspects of the gospels? Yes. Is it conclusive? No. Is it definitive? No. It is, at best, circumstantial (unlike “hearsay evidence,” “circumstantial evidence” is admissible in a court of law—it is, however, given little weight on its own). And even if this citing was conclusive, there is no mention here about a resurrection involving a divine miracle. The Thallus evidence verdict: useless. Once again, what we have here is circumstantial. It is interesting, yes, but it does not validate a single New Testament reference. That the allusion to a “wise king” is a reference to Jesus is, of course, taken for granted. Now, this may very well be the case, but it may very well not be, too. We cannot know whom this “wise king” was to which Mara Bar-Serapion refers. Moreover, even if we do concede that this is a reference to Jesus (which is generous on the part of our impartiality), we have to note, then, that this passage actually casts doubt on the legitimacy of the resurrection. How so? If this “wise king” is in fact Jesus, then we must observe that Mara Bar-Serapion is taking for granted that he is still dead. Why? He says this: “The wise king… Lived on in the teachings he enacted.” If Jesus “lived on” only in his teachings, that fails to separate him from any spiritual teacher or prominent figure from history. After all, the Buddha lived on in his teachings, as did Plato, Aristotle, Hillel, and anyone else you could possibly name. If Jesus is miraculously different from these other figures in that he lived on through a bodily resurrection, Mara Bar-Serapion certainly isn’t privy to it. Thus, if we do concede that this is corroborative evidence for the historicity of Jesus, then it is also evidence against his resurrection. The Mara Bar-Serapion evidence verdict: interesting yet unfavorable. Now, were we to assume that this is, beyond a doubt, the authentic product of Josephus, we would have some interesting points to observe. First, Josephus implies that Jesus might have been something other than or more than a human being. He also apparently confirms that Jesus did some astonishing deeds, although what these were specifically he does not say. We can also surmise from this passage that Jesus was popular with both Jews and non-Jews, that he was killed on a cross, and that he appeared to his followers restored to life on the third day (note, however, the use of the word “spending”; this is very intriguing). Finally, we see that a group called “the Christians” still existed in Josephus’s day, and that this group were followers of Jesus. All very interesting points. However, we must also observe a few other particulars. First of all, this account (assuming it is authentic), was written circa 95 CE. Given the life expectancy of the first century, it is very likely that most if not all of the principle witnesses to Jesus’s life and his alleged resurrection were dead by this time. Thus, Josephus’s account is what’s called “reporting after the fact” and is therefore not only second-hand hearsay, it is based on reports from the second-generation of witnesses; in other words, it is likely that no one whom Josephus interviewed (assuming he interviewed anyone) was actually there or even alive in 30 CE. Again, this is not necessarily surprising or damning for an historical event because most ancient history is this way. However, we have to remember that we are trying to prove the miraculous here. Outrageous claims require outrageous proof. Does second-hand hearsay from the second-generation of witnesses constitute outrageous proof? No, no more than if I were to claim that my friend’s dad, who is dead now, saw Bigfoot in his backyard and that Bigfoot healed his broken arm. Maybe he did and maybe he didn’t, but you wouldn’t have a single legitimate reason to believe me. I wasn’t there. I didn’t see it. The one who was there is dead and cannot add any weight to the claim. Moreover, there are aspects of this excerpt from Josephus that do raise some misgivings, and it is for these reasons, among others, that scholars are acutely suspicious of this passage’s authenticity. For example, it is highly unlikely that Josephus, who was 1) a Jew, and 2) not a Christian, would have affirmed that Jesus was “the Christ.” Josephus knew that the Christ and the Messiah were different titles for the same person. Had Josephus really believed that Jesus was “the Christ,” or “the Messiah,” he would have ceased being a mere Jew and would have been a Christian. We know for a certainty that not only was Josephus not a Christian; he was hostile toward the Christian movement. It is therefore unlikely that he would have used such affirming rhetoric as “if indeed one ought to call him a man,” or, “a teacher of such people as accept the truth gladly,” or (with such blatant finality), “he was the Christ.” These interpolations are too suspicious in nature to be taken for authentic at face value. Even the Christian scholars conclude that something is not right here. The likeliest verdict here must be that either the entire passage is spurious, or at least the parts that affirm Jesus with such an obvious Christian agenda are spurious. Either way, while this passage is very curious and even somewhat titillating, does it constitute outrageous proof of the miraculous? Let us assume, just for the sake of generosity, that it is authentic. Does this mean Josephus has ironclad validation for the truth of those things which he reports, or is he merely passing along what others have told him? Was Josephus there in 30 CE? No, he wasn’t even born at that point. You wouldn’t put your faith in my statements if I said Albert Einstein, who died before I was born, turned into a lizard each night before getting in bed. Why then should we take Josephus at face value, especially when the passage is highly suspicious anyway? Does Josephus cite his sources? No, he does not. Do we have hard evidence of a miracle here? No, we do not. And that is the only unbiased conclusion one can make. The Josephus evidence verdict: highly unfavorable. You will recall that we are attempting to impartially examine the resurrection of Jesus Christ. We have observed that the resurrection violates the Regularity of History, and we have eliminated the empirical and the scientific possibilities. All that remains is the miraculous. Our question now is whether or not there is suitable evidence to warrant belief in this alleged miracle.As far as my research has taken me, the preceding three pieces of evidence constitute the only first century extra-biblical sources to which Christians point. There are more sources they point to, but these come from the second century or later. As such, they aren’t very useful. Why not? Think of it this way: if a miracle allegedly took place in 1830 CE, how qualified to write about it are those people living in 1945? Sure, they may have copies of the statements given by eyewitness, but all the alleged eyewitnesses are dead. The people living in 1945 have no way of interrogating the witnesses for the purpose of measuring their honesty, their body language, or their ability to withstand cross-examination. All that would be left are likely the third-generational offspring of the original witnesses. Thus, to the people living in 1945, this isn’t even hearsay; it’s not even double hearsay: it is triple hearsay. The hearsay is therefore very, very weak. Remember, we’re not just trying to assess who did what on a given historical date. If that was all that were at stake, perhaps we could lessen our stringency a bit. No, we are trying to validate that space and time and the very laws of physics were suspended, violated, and overridden through a miracle wrought by a deity. We therefore must be this stringent. Too much is at stake here; we cannot afford to get sloppy in our examinations. No, we cannot be that irresponsible. For this reason, I do not treat sources from the second century or later as very important. However, for the sake of being thorough, I shall combine all the second century citings in one section rather than exegeting on them individually. As for the third century and beyond, we won’t even attempt the pretense of assuming these have any bearing on our unbiased investigation. Now, were we to group these together under the heading “Other” evidence, what would our unbiased verdict have to be in terms of validating a miracle? Useless. We could not, in good conscience to our aim of impartiality, conclude otherwise. Thus, we have no choice but to mark another check under the heading “unlikely.” So far, we have four checkmarks under “unlikely” and none under “likely.” Things are looking quite foregone at this moment. But perhaps our investigation of the New Testament will save the day? Maybe. However, first we need to address one other interesting bit of evidence. Sometimes the evidence that does not exist speaks louder than that which does. It is therefore difficult to remain unbiased when we note that there were two people living in or visiting Palestine during the life, death, and alleged resurrection of Jesus—two likely candidates who should have recorded these things but who otherwise said not a single word. These two men were definitely not illiterate, as both were known for their extensive writing. Who were these two men? Justus of Tiberias and Philo of Alexandria. Justus of Tiberias. Living in Galilee (possibly in or near either Nazareth or Capernaum) in the first century, Justus was an historian whose works have been lost to history. However, Photios I, who was the Ecumenical Patriarch of Constantinople in the ninth century, makes mention of the fact that Justus apparently compiled a lengthy history of the kings and great leaders of the Jewish people stretching from the time of Moses up to Herod Agrippa II, who died circa 100 CE. Photios, who did have access to this work and who was clearly a Christian, expresses puzzlement over why Jesus fails to make even a footnote appearance in Justus’s otherwise exhaustive account. We too, then, can ask the question as to why this man, who was apparently God in the flesh, who lived and walked in the very same environs where Justus grew up, who finished his life with a great public bang in Jerusalem only to be returned to life three days after his death, and whose resurrected body appeared to a crowd of over 500 people fails to even be fleetingly mentioned in a work that is otherwise supposed to be about such characters. This is very curious indeed. We cannot explain why Justus didn’t mention Jesus because we do not have his work to scrutinize, but we can be certain he did not mention Jesus. One would have to wonder why that would be. Philo of Alexandria. A Hellenistic Jew living in Alexandria, Egypt in the first century, Philo is considered one of the founding fathers of the Logos philosophy. He wrote extensively in the first century on matters of theology, history, philosophy, and even on the Old Testament. We know that Philo spent a great deal of time in Jerusalem during his lifetime, and there is strong evidence to suggest he was actually living in Jerusalem during the exact time Jesus would have been crucified and allegedly resurrected. Based on what we know of his surviving works, Philo is one of those guys who records every tiny little thing, down to the last detail. So, here is a vigilant writer known for detailed reports who is ostensibly living in Jerusalem at the time that Jesus has his triumphal entry, his altercation at the Temple, his arrest, his trial, his execution, and his alleged resurrection. And yet does Philo make even a brief mention of Jesus? No, he writes not a single word on the subject. Philo is absolutely silent on Jesus. I think of this as the evidence that does not exist, or the evidence of the non-evidence, and I feel it certainly screams loudly by nature of its very absence. It is circumstantial, to be sure, and therefore must be treated as any circumstantial evidence ought to be treated. And yet in our unbiased assessment we cannot help but note that this (lack of) evidence does raise some questions. We will not add a checkmark under “unlikely” in this instance, because non-evidence is evidence that cannot be measured, but we must add a footnote to our investigation: two likely candidates who could have corroborated the resurrection failed to do so. At this point, all that remains is to examine the New Testament itself and see if that can shed any light on our pursuit. By way of a reminder, what exactly is our pursuit? It is this: having eliminated the scientific and empirical causes for a resurrection, all that’s left is the miraculous. A miracle is an outrageous claim. Outrageous claims require outrageous proof. We are therefore searching for outrageous proof. As of yet, we have not found any. Stay tuned for Volume Three, which will examine the New Testament.